FAME bursts onto the NSMT stage on May 31! At the award winning North Shore Music Theatre (NSMT), the stage will be bursting with youthful energy when they present the global stage phenomenon, FAME. This production, conceived and designed for NSMT's unique in-the-round stage, will run from May 31 � June 19, 2005. Press Night is scheduled for June 2, 2005 at 8pm. The 2005 musical season is sponsored by Comcast. FAME began as an Academy Award®-winning movie. Then it became an Emmy Award-winning TV series and finally, an international musical theater sensation created by David De Silva (Originator), Jose Fernandez (Book), Jacque Levy (Lyrics) and Steve Margoshes (Music). 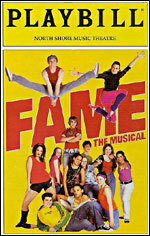 With its high-octane blend of youthful energy, hope and passion, FAME follows a group of gifted students through four grueling, exhilarating years at New York's renowned High School for the Performing Arts. GARETT HAWE (Ensemble, u/s Schlomo) With NSMT: Debut. Elsewhere: Garett joins the cast of Fame having just completed the 1st National Tour of Oklahoma! (Jesse). Regional Credits include A Chorus Line, West Side Story, Crazy For You, Pirates of Penzance, and Titanic. Some of Garett's training includes Ann Reinking's Broadway Theatre Project (2003/2004) and the American Ballet Theatre. This Fall, he will attend the University of Cincinnati - College Conservatory of Music (CCM) as a BFA Musical Theatre major. KRISTIE KERWIN (Ensemble, u/s Serena) With NSMT: Debut. Elsewhere: Kristie tapped her heart out in the premiere of Irving Berlin's White Christmas at San Francisco's Curran Theatre. She appeared in New York's City Center Encores! production of Bye Bye Birdie. Additional credits include On Your Toes (Cape Playhouse), Anything Goes (Shubert Theatre, Cape Playhouse), Gypsy (Louise), Annie Get Your Gun (Annie u/s) and Carousel (Louise). An NYU Tisch School of the Arts CAP21 conservatory graduate (B.F.A. in Theatre), Kristie's thrilled to be with NSMT's Fame! DENNIS MOENCH (Schlomo Metzenbaum) With NSMT: Debut. Elsewhere: Dennis is thrilled to be reprising this role on the NSMT stage. Dennis originated the role Off-Broadway and can be heard on the �FAME on 42nd Street� original cast recording. Most recently, Dennis played Woof in the Downtown Cabaret's production of Hair, directed by Julie Arenal and Wesley Fata. Training: NYU/Tisch. �Many thanks to my agent, Craig Holzberg. Love to Mom, Bruce and Dad.� Visit www.dennismoench.com . VINCENT RODRIGUEZ III (Ensemble, u/s Joe Vegas / Tyrone) With NSMT: Debut. Elsewhere: Just played Andy Lee in Surflight Theatre's production of 42nd Street in Atlantic City's Trump Plaza. This past October, he had the honor of being world premiere of Irving Berlin's White Christmas in San Francisco. National tour: 42nd Street. This July, Vincent will be playing Garvin in Stages St. Louis' production of Footloose. Proud member of Actor's Equity Association. �Love & thanks to family, friends & PCPA Theaterfest.� Please visit www.VR3rd.com . GERARD SALVADOR (Joe �José� Vegas) With NSMT: Debut. Elsewhere: A graduate of the High School of Performing Arts and Music & Art, Gerard is thrilled to be making his NSMT debut with Fame. He last appeared as Pepper on the national tour of Mamma Mia! Other theatre credits include Honk! (Ugly u/s, Helen Hayes PAC), Dogeaters, The Music Man (Tommy Djilas, Sundance Theatre), The King & I (Lun Tha, TBT5), The Boy Friend (Bobby), Divorce Me, Darling (Pierre), Sweeney Todd (CAP21). He has also done extensive voice-over and sketch work for Nickelodeon Television. Gerard received his BFA from New York University's Tisch School of the Arts. Proud member of Actor's Equity Association. INGA BALLARD (Miss Ester Sherman) With NSMT: Nine. Elsewhere: Recent performances include Matron Mama Morton in Chicago (Arts Center in Costal Carolina), Jewel in The Best Little Whorehouse in Texas (Lyric Theatre) and Vera in Mame (Cohoes Music Hall). She has appeared in the National Tour of Ragtime as Sarah's Friend. Her Regional Credits include All My Sons, The Crucible, Ragtime, Showboat, Finian's Rainbow, Abyssinia, Gypsy, Over The Rainbow, Kwanza Song and Nunsense 2. Other Credits include; Ballad of the Sad Café, Agnes of God, A Piece of My Heart", "A Streetcar Named Desire, and House of Flowers; Edinburgh Fringe Festival in Scotland. Film: Aurora Bridge. Training: B.A. Drama University of California at Davis and M.F.A. in Acting from the University of Southern California. �Special thanks to my family.� Inga is a proud member of Actors Equity Association. MICHAEL BRIAN DUNN (Mr. Myers) With NSMT: Debut. Elsewhere: Some Broadway highlights: Cy Coleman's The Life in the starring role of Jo-Jo, Gus/Growl Tiger in Cats, original company of Big River, the revivals of Guys & Dolls, Sweeney Todd, And his B'way debut in Baby. National tours include Amadeus, and HMS Pinafore as Ralph Rackstraw a role he repeated at Canada's Stratford Festival. He had the great fortune of working for Joe Papp in the N.Y. Shakespeare Festival productions of Lenny & the Heartbreakers, The Death of Von Richthoffen, and The Human Comedy. Regionally he has performed lead roles at Baltimore Center Stage, Actors Theatre of Louisville, South Coast Rep, Cincinnati Playhouse, St. Louis Rep, Goodspeed Opera House and Philadelphia's Walnut St. Theatre. Most recently, Michael was soloist in a concert of Irish music with The Hartford Symphony Orchestra. REX HAYS (Mr. Sheinkopf) With NSMT: Evita. Elsewhere: Mr. Hays was last seen on Broadway heading south on the M104 bus. Prior to that he has acted in a number of Broadway hits including Evita, Grand Hotel, La Cage aux Folles, Showboat, Big, Woman of the Year, King of Hearts, Angel, Onward Victoria and Dance With Me. He lives in NYC with his wife Lisby Larson and their two sons Connor and Matthew. He received his M.F.A. in Acting and Directing from Brandeis University. ROSEMARY LOAR (Ms. Greta Bell) With NSMT: Mame, Footloose Elsewhere: Most recently played Marcy in The Audience (2005 Drama Desk nomination for Best New Musical). Broadway: Sunset Boulevard, Cats, Chess, Once Upon A Mattress and You Can't Take it With You. Off Broadway: Gladys Fritts in Radio Gals. National Tours: Cats (Grizabella), 42nd Street (u/s Dorothy Brock). Regionally: Mame (Mame), Phantom (Carlotta), Fair and Tender Ladies (Phoebe Award for Best Actress). As a composer, Ms. Loar has released three CDs and is working on her fourth, which is the score of her new musical, Spoolie Girl. She is also an adjunct professor at NYU/Tisch School of the Arts, where she teaches private voice. For more information got to www.rosemaryloar.com . ALEX DeLEO (Youth Ensemble) With NSMT: The Wizard of Oz. Youth Performance Academy: Holiday Pops, Godspell Junior, Disney's Aladdin Junior, Cinderella Kids. Elsewhere: Alex was a featured dancer in North Reading High's 2005 production of Guys and Dolls, Walnut Hill Summer Theatre's Seussical the Musical, Woody Allen's God and Guys and Dolls. He has performed in MTI Showcases in New York and Atlanta. Alex was also in �Lil' Iguana,� a safety pilot with Cramer Productions and Comcast HDTV �Chins� commercial. Dance/Vocal training: Boston Youth Moves, LeAnne Leslie's School of Theatrical Dance and Music is Art with Barbara Morash. ASHLEY ALEXANDRA FICHERA (Youth Ensemble) With NSMT: Debut. Elsewhere: Performing with New England Civic Ballet for 8 years, Ashley recently performed the role of The Sugar Plum Fairy in The Nutcracker, as well as roles in The Sleeping Beauty and Cinderella. She has performed solo for U.S. Poet Laureate Robert Pinsky, and Southern Maine Ballet. In July, Ashley will attend summer intensive programs at Ballet Met (Columbus Ohio) and Radio City Music Hall (NYC) with the Rockettes. CHRIS MARTEL (Youth Ensemble) With NSMT: Debut. Elsewhere: Chris is happy to be making his NSMT debut in Fame. He has performed in many other shows at school and in community theatre. Chris also plays drums in his school's marching, concert and jazz band, as well as their percussion ensemble that placed 2nd in the country in their division. MELODY OLESON (Youth Ensemble) With NSMT: Showboat, Phantom. Elsewhere: Melody has performed in A Chorus Line (dancer/chorus) at MHS and competed in Showstoppers and International Dance Challenge competitions. She is a member of MHS Dance Troop and studies at A Dancer's Dream, in Marblehead. AMANDA RODHE (Youth Ensemble) With NSMT: Joseph and the Amazing Technicolor Dreamcoat; Youth Performance Academy: The Mystery of Edwin Drood. Elsewhere: Amanda most recently appeared as Cinderella in her school's production of Into the Woods. Amanda has worked with local theater groups including Gloucester Stage Company, Manchester Summerstage and Neverland Theatre. Her favorite roles include Polly Browne in The Boyfriend, Fantine in Les Misérables, and Kim MacAfee in Bye Bye Birdie. ALISON SABEAN (Youth Ensemble) With NSMT: Debut. Elsewhere: Alison was last seen in Seussical the Musical (Who Child). Prior to that, she played and orphan in Annie. She has also appeared in Two By Two Productions' Comedy Tonight, T'was One Crazy Night Before Christmas and Around the World on Broadway. Alison attends Dunn Middle School where she enjoys performing with the band and jazz band. AMY SABEAN (Youth Ensemble) With NSMT: Debut. Elsewhere: Amy has performed with her school in Seussical the Musical (Who Chorus) and Annie (Orphan Chorus). She has also performed T'was One Crazy Night Before Christmas (Trisha), Comedy Tonight (Rita), and Day of Peace (Chorus/Reader) with Two by Two productions. During the school year she plays trumpet in her school's band and jazz band. FAME marks the return of Director and Choreographer Richard Stafford. Mr. Stafford was the Director and Choreographer of NSMT's smash hit productions of Swing! and Cats. His work has been seen around the country and around the world in directing and/or choreographing productions of Cats along with The Full Monty, Beauty and the Beast, Phantom of the Opera, Joseph and the Amazing Technicolor Dreamcoat, Oliver!, The Who's Tommy, Phantom, Evita, Oklahoma!, On the Town, Camelot, My Fair Lady, Sweeney Todd, She Loves Me, Grand Hotel and The Goodbye Girl. The creative team for FAME will be Andrew Graham (Musical Director), Jonathan Stahl (Associate Director & Choreographer), Howard C. Jones (Scenic Design), Joanna E. Murphy (Costume Design), David Neville (Lighting Design), John A. Stone (Sound Design), Gerard Kelly (Hair & Wig Design), Bethany Ford (Production Stage Manager), Matt Schreiber (Casting). Tickets for FAME are priced from $63 to $30. Performances are Tue. � Sun. For show times, tickets and information log onto www.nsmt.org, call (978) 232-7200, or visit the Box Office in person at 62 Dunham Rd. Beverly, MA 01915. Related free events: 6/7: Meet the Theatre after the 7pm performance, post show audience discussion with the artists; 6/12: Spotlight on History, a free pre-show discussion focusing on historical issues related to the performance; 6/16: Out at the North Shore, an evening for the Gay and Lesbian Community with a post show reception; 6/18: Meet the Theatre after the 2pm performance, post-show audience discussion with the artists. 3-Pack special offer (buy 2 shows get 1 free) is now available, but only by phone (978) 232-7200. Offer can not be combined with any other discount.